If you’ve been to a home improvement store within the past 6 months, you’ve noticed household incandescent bulbs have given way to new, sometimes unfamiliar technologies. You may find a couple “full spectrum” incandescents or Halogen floodlights, but other than those, compact fluorescent and LED bulbs line the shelves. Long gone are the days of throwing your favorite brand of 60-watt light bulb in your cart and being on your way. No, you may not even be sure which funny-looking 60-watt equal light bulb you need. Wondering how to calculate the lumens of your incandescent bulb? Check out From Watts to Lumens: Choosing Lights Based on Brightness. 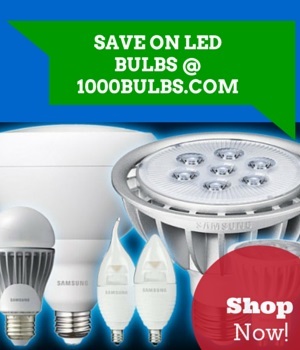 Before buying a CFL or LED light bulb, get rid of any notions you have about incandescent equivalencies. How many times have you bought a 60-watt equal CFL or LED only to be disappointed by how dim it was (or blinded by how nauseatingly bright it was)? Because there is no agreed-upon standard among manufacturers for determining equivalent wattages, statements of incandescent equivalency for CFLs and LEDs are not always dependable. So to light your home the way you intend, stop thinking about watts and start thinking about lumens. For the average living room of 250 square feet, you’ll need 5,000 lumens as your primary light source (20 lumens x 250 square feet), equivalent to about five 100 watt incandescent light bulbs, five 23 watt CFLs, or eight 10 watt LED light bulbs. Since you probably read on your couch, you’ll also need about 4 square feet of task lighting on each end of the couch. That’s 200 lumens each (50 lumens x 4 square feet), but you’ll need more if the light source is a lamp with a shade. In your dining room, you’ll want about 30 lumens per square foot on your dining table (you want to see your food, but not examine it), so if your table is 6 x 3 feet, that’s 540 lumens. Keep in mind, however, that these numbers are for typical conditions. If you have especially dark walls and furniture, you’ll need brighter light sources. The distance of your light source from the surface also changes the equation. We based our calculations on 8-foot ceilings and average height task lamps. Finally, personal preference will play the largest part in your decision. If you like the room to be especially bright, you may want to add 10 to 20% to our numbers. In fact, the best idea for any home may be to aim high and install dimmers to bring the light level down to where you want it. So how much have you thought about how many lumens you need for your home? Are our numbers too high or two low? Let us know in the comments below, on our Facebook or Twitter, or even post a photo of your home on Pinterest and share it with us!